Financial Advisor Quality Ratings Are Here! 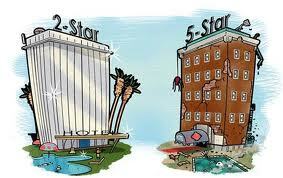 You have been able to view the ratings of restaurants, hotels, vacation destinations, and mutual funds for decades. The source of the rating gathers the data, applies a rating algorithm, and publishes a report. Ratings also include a report that documents the facts about the product or service. You use the rating and report to make your selection decision. One of the most important financial decisions you will ever make is the selection of a financial advisor. However, until now, you have been on your own to develop your own data-gathering tool and a rating system that compares advisors to each other. However, very few investors are going to take the time to produce their own processes. Financial advisors are more than willing to fill the vacuum with sales pitches, undocumented sales claims, and marketing materials. What About Public Data for Financial Advisors? Unlike other types of products or service-providers there is a limited amount of public data for financial advisors. In the past, your only reliable source was FINRA, the regulatory agency for broker/dealers and their representatives. FINRA focuses on advisor compliance records. Best case, this is about 25% of the information you need to evaluate and select financial advisors. It is up to you to obtain the other 75%. Why isn’t there more public data? Wall Street does not want you to have this information. If you had more information you would not buy from thousands of low quality advisors who work for Wall Street firms. Paladin (www.paladinregistry.com) has been researching advisors for investors since 2003. It recently added a free advisor quality rating tool to its website. This tool asks you ten questions about a prospective or current advisor. Your responses produce the quality rating. What if you don’t know the answers to the questions? You can use Paladin’s free Request for Information to obtain the information you need to document financial advisor credentials, ethics, and business practices. Paladin also provides a free Scorecard service that makes it easy to compare advisors to each other. This free process for gathering advisor data and rating the quality of responses is available on Paladin’s website. What if an advisor refuses to respond to Paladin’s request for information? Financial advisors do not withhold positive information. They withhold information that would cause you to reject their sales recommendations or terminate current relationships. Withheld information is a major source of financial risk that benefits advisors and not you. Any advisor who withholds information should be automatically excluded from your selection process or terminated if he is your current advisor. Good and bad financial advisors look a lot alike. That’s because bad advisors know how to market themselves as financial experts. Your only protection is an objective process that helps you determine the actual quality of financial advisors. You can develop your own process or you can use the free process that has been developed for your use on Paladin’s website.